The archipelago of the Aeolian Islands, accessible by ferry and hydrofoil, is one of the most famous tourist destinations of Italy, suited for both a luxury and cheap tourism. The seven main islands -Alicudi, Filicudi, Lipari, Panarea, Salina, Stromboli and Vulcano- and the smaller islands are a paradise for lovers of sea and sun, but also for sports enthusiasts, lovers of water sports a/o trekking. 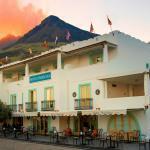 Trips to the discovery of volcanic mountains give amagnificent view over the sea. A curiosity: in the basin of the extinct volcano Monte delle Felci on the island of Salina you can find some good mushrooms in late September. The 5-star hotels in the Aeolian Islands are always well immersed in the natural environment of the archipelago, never too intrusive and always equipped with all amenities. There are also hotels with private beach and spas available. Panarea is the island of VIPs, with white villas immersed in bougainvillea vegetation. Lipari is the major islans, with the homonymous town where you can also find cheap 2 and 3 star hotels. the ‘sciara del fuoco’ is the amazing slope over the sea that you enjoy after climbing the Stromboli(only by guided tours organized by the CAI, Italian Alpine Club)to see the explosions of the volcano at night. Alicudi and Filicudi are two untouched jewels where until a few years ago, there was not even electricity. Vulcano dominates throughout the archipelago, with its majestic and air permeated by the smell of sulphurous mud which tourists use for achieving... eternal youth. 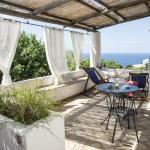 The Bed and Breakfast Casa Mafalda is centrally located in Lipari. The property is located a short distance from the beach and marina and is an ideal base for touring the nearby islands and enjoying numerous sports.